The foundations of restorative practices are central to a healthy environment at home, in the workplace, in neighborhoods, and within local organizations, as well as within schools and the court system. These principles are a unifying force wherever people are in community with each other. We believe conflicts can be peacefully resolved, neighborhoods can become safer, and families feel more supported when everyone involved is an active and important a part of a larger whole. Members speak and listen from the heart. There is a conscious and spoken value placed on positive relationships. There is an expectation that decisions and actions will be made “with each other, not “for” or “to” by one segment of the community to another. There is a non-punitive response to wrongdoing with the intent to promote healing and learning to avoid future harm. Restorative practices provide the skills and practices to bring people together in a respectful way. They provide a common language and approach which will lead to a strong community of shared values -- capable of addressing issues, resolving conflict, and developing and living a shared community vision. Here are some of the local organizations that we actively partner with to help create a more just, equitable and compassionate community. 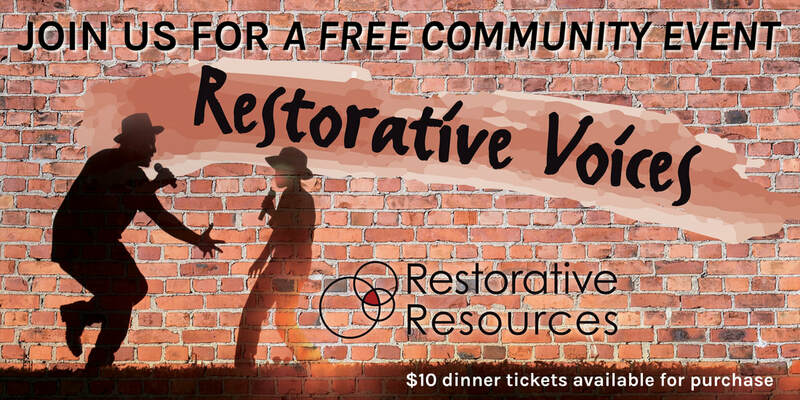 Our First Restorative Voices Community Event was a Success!